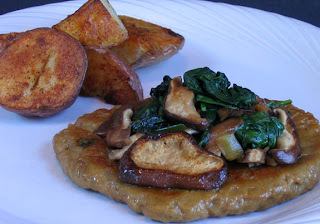 With fresh shiitakes and spinach in the house, it was fate that they end up in the same dish with my seitan. The whole thing came together in about 15 minutes. First I sautéed the spinach, took it out of the pan and set it aside. Then I sautéed the shiitakes with some green onion and a little soy sauce and mirin, and that, too, out of the pan. Into the same skillet went the seitan cutlets, which I cooked until hot and golden. After plating the seitan, the spinach and shiitakes went back into the skillet for a final blast of heat. Then I then piled it all on top of the seitan. Simple, elegant, delicious. You get the idea. Now about those potatoes…. One thing I like about potatoes (there are probably a million things I like about them, but I’ll try to concentrate on just this one) is their versatility. Take simple roasted potatoes for example, like the ones you see sharing the limelight with the seitan. They would have been perfectly yummy if just tossed with olive oil and salt and pepper before roasting. But here’s the thing: potatoes lend themselves to virtually any kind of seasonings. Add some spices (like curry or jerk spices), herbs (like fresh rosemary or basil), or other seasonings (such as garlic, lemon juice, and capers), and you can dress your spuds to go with anything. This time I used a fantastic spice blend from Chile called mapuche, a mixture of hot red chiles, cumin, coriander, and salt that gave the potatoes a wonderful flavor and lovely color. We enjoyed another terrific noodle dish for dinner the other night, this time inspired by the flavors of Vietnam. 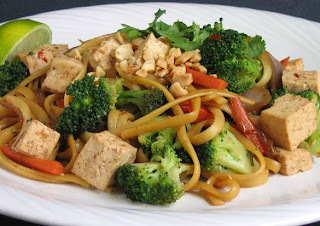 First, I assembled the ingredients: cooked linguine, shredded carrot, steamed broccoli, green onions, cilantro, peanuts, and tofu (you can use tempeh or seitan, if you prefer). I then made a marinade for tofu consisting of soy sauce, rice vinegar, brown sugar, hoisin, chile oil, and crushed red pepper flakes for some heat. In a medium bowl, combine the soy sauce, vinegar, sugar, hoisin sauce, chili oil, and red pepper flakes. Add the tofu and toss to coat. Set aside. Heat the oil in a large skillet or wok over medium-high heat. Add the carrots and scallions and stir-fry for 1 minute. Drain the tofu, reserving the marinade. Add the tofu to the skillet and stir-fry for 5 minutes. Add the broccoli, noodles, and the reserved marinade and stir-fry to heat through. Add the cilantro and peanuts, tossing gently to combine. Taste and adjust the seasoning. 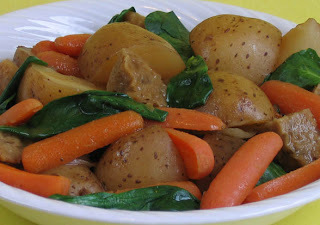 It’s almost St. Patrick’s Day, so I decided to make “Almost Irish Stew” from Fresh from the Vegetarian Slow Cooker. It’s one of those basic “comfort food” stews that is perfect on a cold rainy day. I used baby carrots (halved lengthwise) but you can use sliced regular carrots, if you prefer, and any kind of white potatoes work well — just make sure they’re cut uniformly so everything gets done at the same time. I included diced seitan in my stew, but you could use white beans instead — it tastes great either way. When I want extra flavor, I sauté the onion in a skillet first, but this time I skipped that step and it still tasted great. You can also sauté your seitan before adding it to the slow cooker, if you like it nice and browned. Again, it’s a personal choice. To celebrate St. Patrick’s Day, I wanted to boost the Irish factor with a touch of green, so I added some fresh baby spinach (blanched first and then added close to serving time). Kale or cabbage would be good, too, but I especially like how the bright green spinach, orange carrots, and white potatoes show the colors of the Irish flag! With the slow cooker doing all the work, it will give you time to make a loaf of Irish soda bread. Adapted from Fresh from the Vegetarian Slow Cooker. Variation: Substitute cooked white beans for the seitan. Instead of spinach or kale, you can substitute cabbage which can be added raw to the slow cooker when you add the carrots and potatoes. Place the chopped onion in the bottom of a slow cooker. Add the carrots, potatoes, garlic, stock, bay leaf, wine, tamari, thyme, and salt and pepper to taste. Cover and cook on low for 6 to 8 hours. About 30 minutes before serving, add the spinach and seitan. Taste and adjust seasonings. Serve hot. I always cook pasta a pound at a time, even though we usually eat only half of it at any given meal. I do this because I love having extra cooked noodles on hand to inspire me to make a quick and easy dinner the next day with the leftovers. 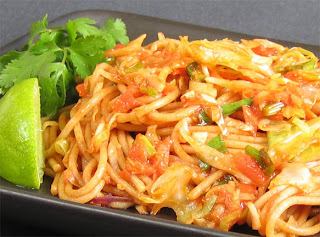 This week, the extra pasta was angel hair and the answer to what to do with it was pancit, the popular Filipino noodle dish. I know angel hair isn’t traditional for making pancit, but everyone who makes pancit has their own variation, and this is mine. I used the recipe from Vegan Fire and Spice and added some tofu and cilantro — so good! This recipe is adapted from Vegan Fire and Spice. 2. Heat 1 tablespoon of the oil in a large skillet or wok over medium high heat. Add the tofu and stir-fry until golden. Remove from the skillet and set aside. 3. Heat the remaining oil in the same skillet over medium high heat. Add the onion, garlic, cabbage, and carrot, and stir-fry for 5 minutes. 4. In a small bowl, combine the water, soy sauce, tomato paste, and chili oil, stirring to blend. Add to the vegetables and cook 2 minutes longer. 5. Add the cooked noodles and reserved tofu and toss to combine. Season with a generous amount of black pepper and add additional soy sauce, if desired. Cook until hot, then transfer to a serving platter or individual plates and garnish with lime wedges and cilantro, if using. I often find myself craving tofu and like it prepared in a variety of ways. 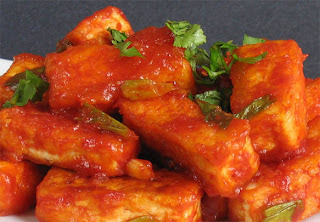 One recipe that has a regular spot in my menu rotation is the Red Hot Chili Tofu from Vegan Fire and Spice. The tofu gets dredged in cornstarch and cooked to a crisp golden brown. It is then cloaked in a spicy red sauce that coats the tofu with flavor. The “red hot” in the title has as much to do with the color as with the heat. With one teaspoon of chili paste, I’d call it moderately spicy, and since we like our food extra-hot, I usually toss in an extra “oops” of chili paste into the sauce. This recipe makes just enough sauce to coat the tofu, so if you want extra sauce, simply double the amount of sauce ingredients in the recipe. In a small bowl, combine the tomato paste, water, soy sauce, sake, and sugar. Mix well and set aside. In a shallow bowl, combine the cornstarch and salt. Dredge the tofu strips in the cornstarch mixture, shaking off any excess. Heat 2 tablespoons of the oil in a large skillet or wok over medium-high heat. Add the tofu in batches and cook until golden brown. Transfer to a platter. Heat the remaining 1 tablespoon of oil in the same skillet or wok over medium-high heat. Add the scallions, garlic, ginger, and chili paste, and cook, stirring for 15 seconds. Add the reserved tomato paste mixture and stir until well blended.